I have a job from client and he just give me free to draw mascot of merchandise. The mascot is related into crocodile and shark or something else which is represent the town. He wants me not quickly to decide the mascot. It needs some serious concept and philosophy. Honestly, I don't like client like him. Because he just let me think by my self. Why I don't like it? because, you can imagine how long the design is done. Because if I have an idea and then I tell him about my idea, and he likes, it's OK. But what about if he doesn't like my idea? The hard thinking that I spent is gone by the win! The good client is, he or she has to tell me the concept. Because he is the owner of company, not me. So, he knows what he thinks, not me. The situation is different if I work with him and he pay me salary every month. I'm a freelancer. So, you must pay my time every hours or days. Can you? Because of, he is my friend, so, I just relax and not to be stress to think hard. I will wait for his idea and then realize his idea into design. But, I like to draw by my self and share to somebody. 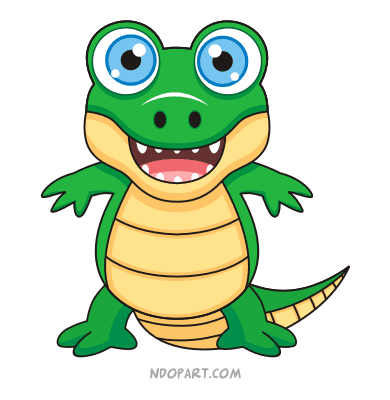 So, this cute crocodile is FREE for you! I think if we have company, not always have a mascot right? Logo I think is enough. So, I email him and tell that I can help him for a logo, not a mascot. If he ask me for a mascot, he has to tell me the concept, I don't like to work every day (thinking is a work) and he doesn't pay me for that (cause I'm a freelance, not his employer). Thank you, the picture is beautiful.